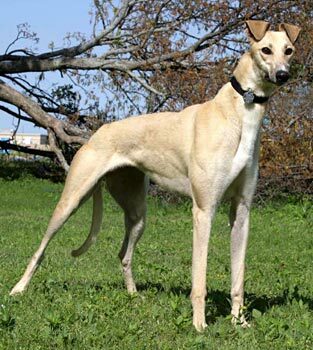 Ebro is a 1½-year-old light fawn female born August 2, 2006. Her sire is Dodgem By Design, making her grand sire Gable Dodge, and her dam is Smart Serena, making her grand sire, Molotov. Ebro has only 7 races to her credit, all at Valley Race Park in Harlingen, Texas, beginning on February 22, 2008 and ending on April 4, 2008. Ebro just didn't have the desire to race competitively – she feels she is much more suited to be a retired racer. Ebro is a big, sweet girl with lots of love to give. Ebro meets Dom, the test cat: Ebro was quite curious about the cat but lost interested after sniffing him and getting a closer look. She should be cat trainable. Of course, close supervision is strongly suggested when introducing any Greyhound to a new family. Cute ears! She'll have to show those cute ears to a small dog at a later time. 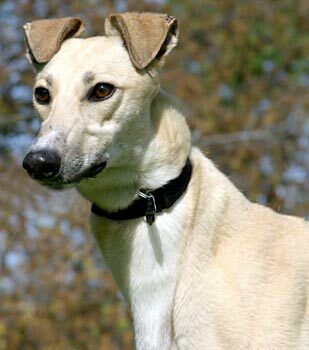 From her cute ears, beautiful black eyeliner, and stunning champagne color, Ebro is one of the most stunning greyhounds Ive ever seen! She also has a wonderful temperament. She will be 2 years old in August, so she does have some puppy left in her, which can be quite amusing. When Ebro first came into our house she was VERY excited. Everything was so new to her and she couldnt get settled down enough to find a bed on the floor. She roamed around as far as I would let her go, smelling every nook and cranny. I thought we were going to have a long night ahead of us, but she quieted down as soon as the lights went out and slept all night. I didnt hear a peep! Now she has settled in to retirement very well. She is a very easy going dog and will lounge around, but she loves to play with squeaky toys and prance around the house with them. She spends most of the day right by my side or where she can see me. Ebro lives with 4 cats, 2 greyhounds, and has a small dog, a miniature pincher, that comes over regularly to visit. She LOVES our 7 year old human daughter, Molly. When Molly comes in from playing at a friends house, Ebro gets very excited and runs around in circles. I dont think she knows her size! She is also extremely affectionate. She likes to sneak up her front paws on the couch or on my bed so that she can lay her head in my lap and be scratched behind her ears. Potty training Ebro has been a breeze! She now knows to go to the back door and wait - someone will let her out. I do have to wait quite a while for her though, as she likes to sniff everything before she goes! She goes on a walk every other day and she does very well on a leash. We do have a lot of rabbits in our neighborhood, so those can definitely be a distraction, but she is slowly learning that they are a fixture in the neighborhood. Ebro is definitely food motivated. She is a very fast eater and enjoys an after-dinner treat of a marshmallow or some yogurt. Ebro goes in her crate, usually willingly, when we leave. She does howl and throws the best fit she can when we first leave, but she is always quietly laying down when I come home. 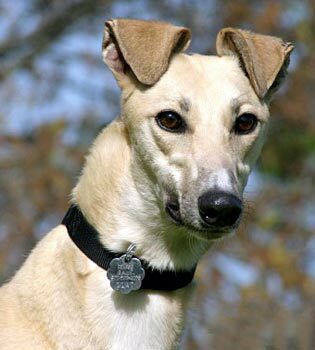 Ebro will make a greyt companion for any family! She is a very special girl.